Sometimes you find the best things when you are able to ‘sneak away’ for a bit. Here are a couple of the sweetest vintage Poodle dog figurines I came across and the big one is one poodle I have never seen before as it has red rhinestone eyes, a rhinestone collar and fur on ears and paws, and all ceramic! 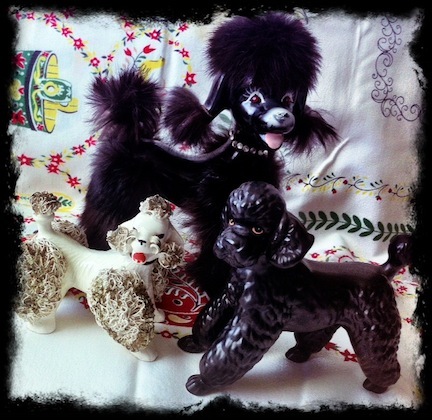 The beautiful vintage black Lefton Poodle has an amazing little face in person and the cute vintage white spaghetti poodle with a khaki green color on its spaghetti is one I haven’t seen before either. Also, I couldn’t resist these anthropomorphic veggie and fruit head cuties!! 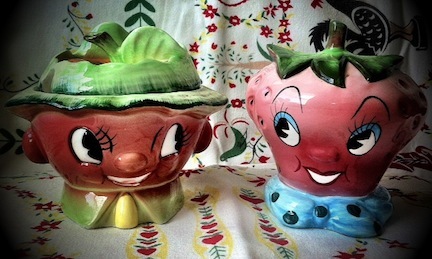 A Vintage PY Strawberry planter and a vinage ESD Turnip or is it an Apple planter, these two make me smile. Hope you are all finding goodies this weekend! !